Figure 1A: Tuareg rebels with their weapons. 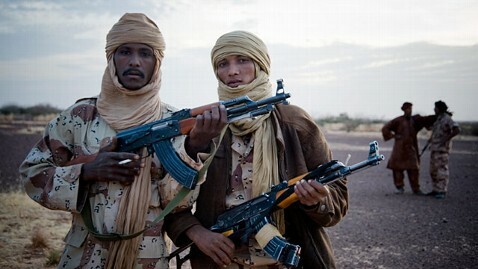 They are thought by many to have been the instigators of the present conflict in Mali. At the end of this series of articles, I wanted to then discuss the theology behind the Transatlantic Slave Trade. If you have as many as 100 million people being snatched from one area and moved to another in two centuries, someone had to have seen it. Someone witnessed it. Someone saw it. It is impossible to ignore and for those that are the product of it, this is impossible to forget. Every year, I receive e-mails on the 6 million, the 6 million, the 6 million. People send pictures of themselves standing at Auschwitz, teary eyed with their lips pursed, some clutching their bags in grief. Then what about 100 million? What about 100 million? If we must say HaShoah, the Holocaust, should be not also say Maafa? Since we’re in the mood to remember everyone, including the Armenians and their 1,500,000, then what about 100 million (if you’re asking whether or not I’m making this a number game…of course I am. Who remembers six million at the expense of 100 million? What is a larger catastrophe?) and all of what has transpired? The 100,000 Muslims killed in one day in Antioch about 900 years ago, the 100,000 Muslims in Jerusalem killed on one day 900 years ago and also those 1.6 million Muslims deported from Spain in the year AD 1699 who even had to dig up their dead loved ones and carry the biers on their backs as well as the Palestinian tribulations. Yes, let’s remember. Let’s remember all of that stuff. Let’s really think about it. Let us remember all of these outrages and what I did not mention…all of it; but I return to my original point. So I thought that maybe I would try to present a theological framework to this matter. Anything as large and horrific as this has to have a theology behind it and principles that will ensure that this never happens again. So then let us remember. So do not force your young women into prostitution in order to make some worldly gain while they desire chastity; but if they are forced, then indeed Allah is Forgiving and Merciful after their compulsion. Religious prostitution is unacceptable. It is for this reason that, no matter the cost of life and no matter what those women might have thought, the last of the temples dedicated to Lat were demolished and these prostitution orders broken up and many of these women were married. Permanent race based slavery is never permitted. Muslims have no history of stating that a particular race or skin colour or complexion of people deserve to be slaves in perpetuity and then reinforcing it in their laws. Those who have made a vow about coming near their wives and wish to free themselves from what they said, in that case they must free a slave before they have any physical relations with each other. That is an admonition for you so that you do not repeat that action. Allah is All Aware of what you do. We must make sure that not only do we free slaves, but also make it possible that they can rebuild their lives and they do not become a permanent underclass, as they have in the United States. In every book of fiqh, in all the legal schools of the Muslims, there is a chapter entitled, “The Manumission of Slaves,” and another entitled, “The Emancipation and Freeing of Slaves,” which is compulsory for students to learn as part of their curriculum. I may be wrong, but for some reason I have not found this in the Magna Carta (AD 1215), Bill of Rights (AD 1689), Settlement Act (1701) or the US documents (AD 1776) until much later and these had to be amendments. Looks like the Muslims had it right the first time. nothing was put into place to assist the growth of these communities as most of them left these plantations with no property or wealth. In some cases, freed blacks that had abandoned plantations re-enslaved their employees who were looking for work. They had no means of forming communities, resisting institutional racism by self sufficiency programmes, nor sustaining what they might have already built by pooling their resources. A classic case in point was that of Rosewood. The blacks in the Reconstruction period built an economic base that was greater than that of any white community in the United States, but in one night of terror from Americans, it was reduced to ashes. The Ottomans, Mamluks, Corsairs, Tatars and several other nations were all freed slaves and they came to be the very rulers of the Muslim world. In fact, the Ottomans ruled the Muslim world for 600 years, longer than the Arabs before them had. Egypt has been ruled by freed slaves since the first conquest by the Companion, `Amr ibn al-`As, may Allah be pleased with him, some 1400 years ago. The vast majority of its’ rulers have been of that category. Muhammad `Ali Basha, the son of freed slaves with green eyes and a red beard, was accepted as the ruler over the Egyptians, after defeating the previous rulers (also freed slaves), the Mamlukes. The same thing has occurred in south Egypt (today’s “Sudan” and its’ constituent parts) as well as the horn of the Great Continent. In the United States, blacks make up a disproportionate number in the prison system although they are only between 14-17% of the population. Much of the celebration of Barack Obama I found strange as the man has one Kenyan father and a white mother. No blood from those in the Transatlantic Slave trade runs through him. His wife and children…definitely; but no such blood runs through him. There has yet to materialise, a black president of the United States (no matter what spin you put on it). Black neighbourhoods, schools are always the most impoverished and blacks are indicted much more quickly than Americans in the US and the same holds true for so many other things. Yet, no one wants to deal with this fact. The US is a classic case in point that permanent, race based slavery is never acceptable and has long lasting effects in the destruction of peoples and the shaping of the mind set of another people. As a social experiment, the next time you are in the United States, call the police stating that you saw a black man loitering outside of your house with his hat turned backwards and that he is about 6’0 and 250 lbs. One week later, call the same police station and say that you saw two white men, 6’0 tall, 250lbs, each with a shiny object in his hand that you think is a gun and the two of them are looking at your house. Record the time it takes for them to arrive at the address in question. Now ask yourself this question: how long will the legacy of the Transatlantic Slave Trade carry on in the US and be reinforced on the Great Continent? This can be read in the fourth volume of Imam Ibn Hisham’s As-Sirat un-Nabawiyyah.